We worked alongside the main contractor and M&E subcontractors to complete projects at six schools on five different sites. The projects range from construction of new two-storey classroom and staff blocks to building new kitchens to refurbishing existing spaces. The new facilities will help the Borough to meet the educational needs of its growing population. At each site the works were completed over 2 phases. 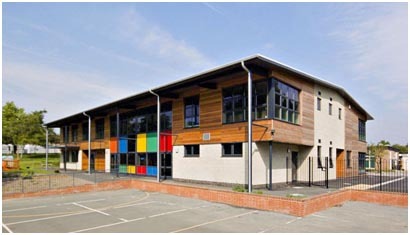 Phase 1 consisted of the construction of a new purpose built building. Each new building was different, and varied dependant on the end use, location and planning constraints. They were designed and built to achieve BREEAM Very Good. This was achieved by the installation of Photovoltaic panels, energy efficient lighting, green roofs, gas absorption heat pumps coupled to underfloor heating systems and natural ventilation. Phase 2 consisted of the refurbishment and extension of the existing school’s accommodation, providing better kitchen facilities, more versatile teaching spaces, installation of a new fire alarm system and upgrades to the existing emergency lighting & CCTV systems throughout the existing buildings. For more information on our project or the services we provide contact us today by filling in the form below.